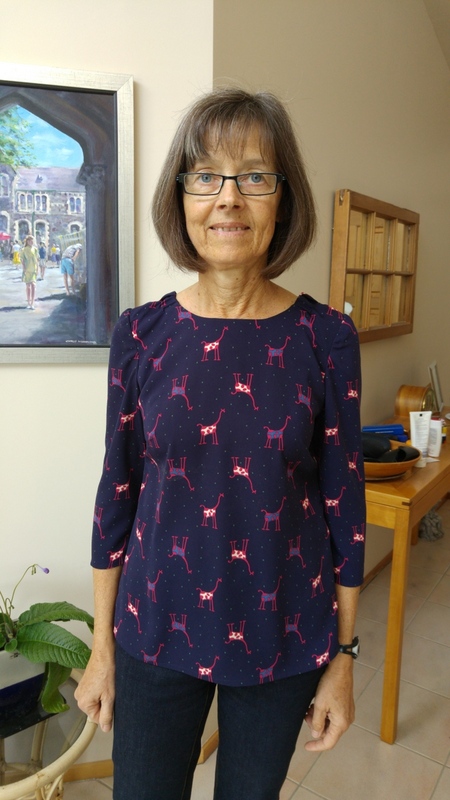 Over a year ago, bought a cute giraffe print on a navy background from Blackbird Fabrics with thoughts of making a dress for my granddaughter. But I decided the fabric was too dark for a little girl. Then I thought it would make a nice blouse for my daughter to wear to work as she is a pediatrician. But she has specialized in pediatric ICU now and wears scrubs to work all the time. So I decided to make a blouse for me! 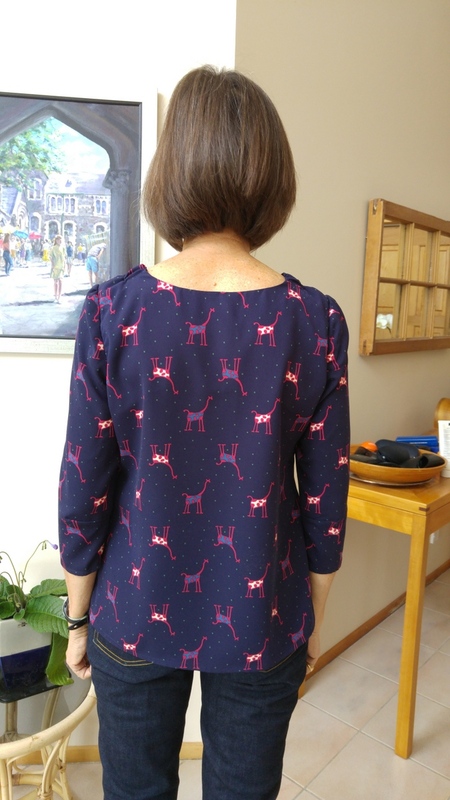 Because of the biggis print, I didn't want too many seam interruptions on the front so I chose the Everyday Blouse, which I downloaded from the Upcraft Club website. Here's an example make from the website. The fabric is a polyester crepe, 59 inches wide, and I bought 2m. For interfacing, I used FashionFuse Soft Knit 40 g/m2 from Hawes and Freer. As I am short-waisted, I shortened the bodice by 3/4 inch. I made no other adjustments. I prewashed the fabric on a cold, gentle cycle machine wash. When cutting the fabric, I lined up the front and back so the pattern matched below the front dart. I cut each sleeve separately and tried to line it up so the pattern on the sleeve matched the front below the dart. I made a size small. Equipment: Janome Memorycraft 6600 Professional, thread tension 4, stitch length 2.2mm; Brother 3034D to overlock seams (3-thread); 14 universal needle. The pattern directions were excellent - very easy to follow with more detail than on 'big 4' patterns. It was a little fussy to do the elastic at the shoulder but the directions were very clear so there were no mistakes! Also remembered to make sure the front and back lengths matched up before hemming as the front and back are not sewn together all the way to the hem. I was pleased with the result. The shirt has a very relaxed fit and is comfortable. My one issue was that the lower sleeve below the dart was rather tight - and I have pretty thin forearms. If I were to make it again, I would allow another half inch at the sleeve hem, tapering from the elbow. And I might just leave out the sleeve dart as the sleeve seems to hitch up just a little along the seam below the dart.